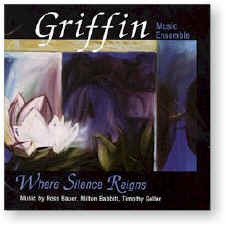 Where Silence Reigns features the composers and musicians of the Griffin Music Ensemble in its recording debut. The Griffin Ensemble, presented by the Wang Center for the Performing Arts since 1989, is a major forum for the performance of contemporary music in the Boston area. The Griffin Ensemble composers are Allen Anderson, Ross Bauer, Anthony Brandt, Timothy Geller, Jeff Nichols, Dave Rakowski, Beth Wiemann and Arlene Zallman. In this program, Along the Way by Bauer and Where Silence Reigns by Geller from the audacious Consortini, a predictably stunning guest appearance by legendary composer and longtime Griffin supporter Milton Babbitt. Together, these three works provide a clear view of the range and power of contemporary music, perhaps even a glimpse of the future. Recorded on (#1) 10 June 1988 and (#2) 24-25 August 1990 at Slosberg Recital Hall at Brandeis University in Waltham, Massachusetts, and (#3) 13 January 1991 at Tsai Performance Center in Boston, Massachusetts.